Throughout Shazam!, we see many references to the number 7. Wizard: My job is to protect you the seven worlds of the seven main sins. Sivana: That seven symbols. Total seven times repeated. Wizard: The Seven Wizards, Seven Thrones. But at the end, Shazam! splits his power with his 5 siblings, and we have a total of six heroes. I half expected an additional hero to show up, or some way of having seven heroes to battle the seven sins. This could mean Billy had all the powers, and each other hero specialized in a specific aspect (similar to what we saw, one had lightning, other had speed, etc). Does the number 7 have a deeper meaning in the Shazam universe? Will a 7th hero be found? Or was this just something based on the 7 deadly sins, and 6 super-heroes was just randomly based on the amount of kids in the foster family? 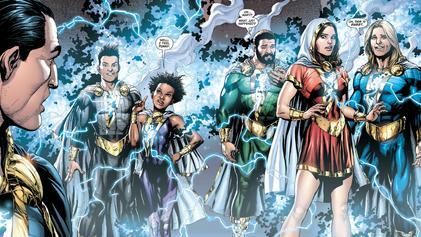 In comics, 6 was the max member of Marvel/Shazam family at a time. the wisdom of Solomon, granting increased intellect; the superhuman strength of Hercules, the superhuman stamina of Atlas; powers from Zeus, including the ability to summon lightning; the increased courage of Achilles, as well as being nearly indestructible; and the superhuman speed of Mercury, which provides him with the means of flight. Not the answer you're looking for? Browse other questions tagged analysis dc-extended-universe shazam .